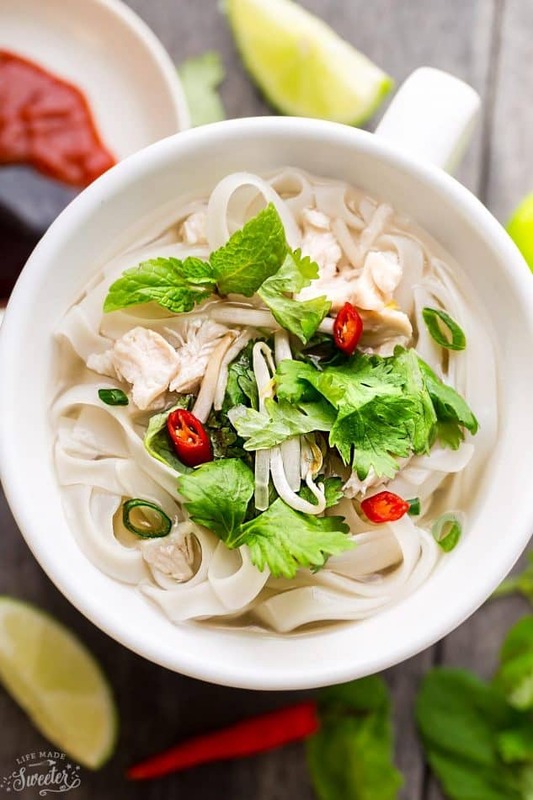 Faux Chicken Pho makes the perfect easy weeknight meal with all the favorite flavors of the classic Vietnamese noodle dish. Best of all, it comes together in as little as 15 minutes! Plus a step-by-step video. When the weather gets cold, there is nothing more I love than a steaming bowl of soup. 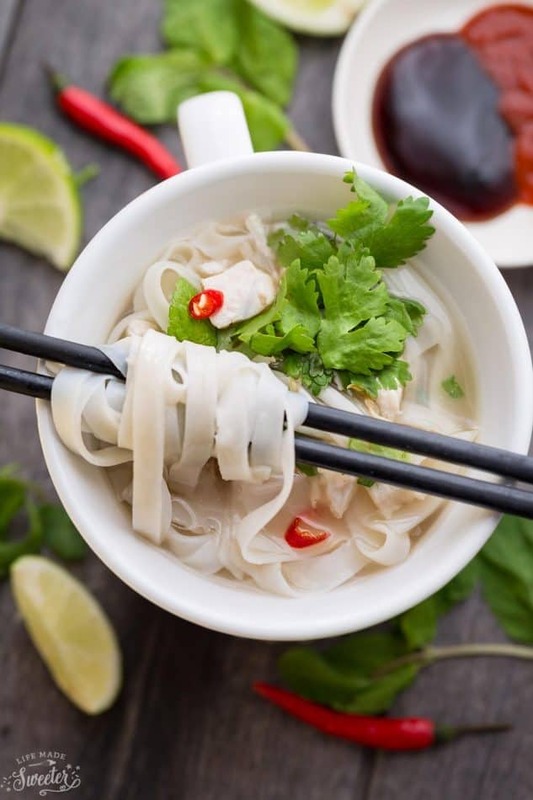 Phở is my absolute favorite comforting dish – it’s the definition of soul food to me much like a bowl of chicken noodle soup is to so many of us. Let me start by saying, this is not an authentic phở recipe. If you are looking for an authentic version, you can check out this popular Pho Beef Rice Noodle Soup I shared a few years ago. This Faux Chicken Pho is for those times you need something that is fast, is tasty and slurpable and kind of tastes like phở. AKA Faux Chicken Phở made in these fun new Meal Mugs I was sent from Corningware. 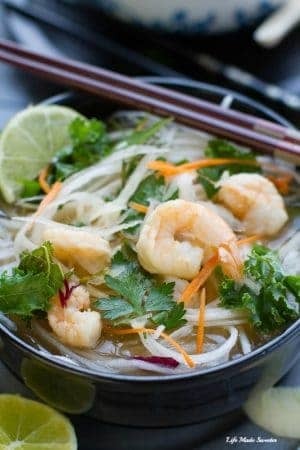 They are the perfect size to make a single serving of pho in just a fraction of the time of the traditional recipe. And since they are made of durable stoneware material, you can easily make this in the microwave or your oven once it’s been preheated. They’re also safe for the dishwasher, refrigerator and freezer. My favorite part are the vented lids (NOT OVEN SAFE) which means no more splatter when heating your soup in the microwave. You can find the mugs at Walmart, Home Outfitters, ShopWorldKitchen, Amazon and more. 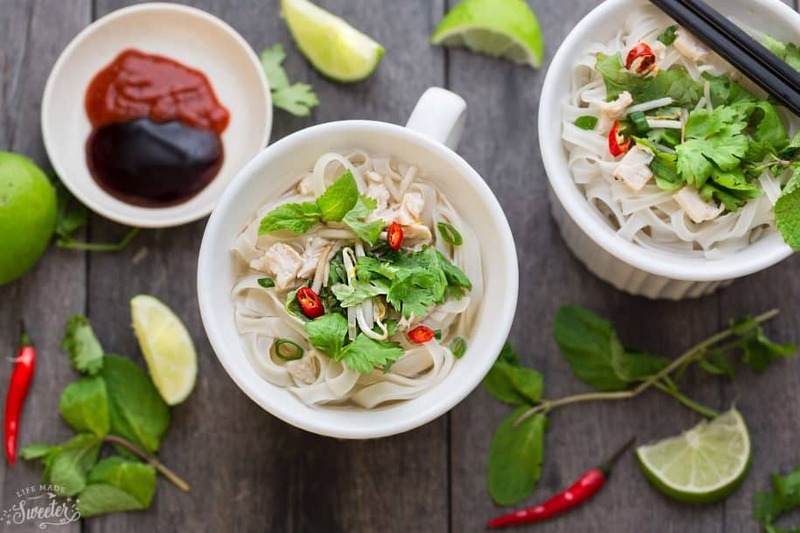 This Faux Chicken Pho does the job in a pinch when you can’t get the real thing and is a lot healthier than those 15¢ packs of ramen. The best part is that it cooks up in as little as 15 minutes in the microwave and just 25 minutes in the oven. So it’s just perfect for busy weeknights and you can easily double or triple the recipe if you want to make more than one serving! 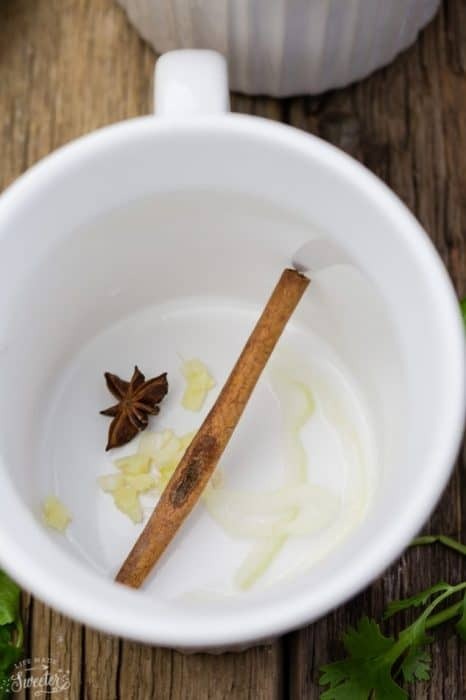 You start by adding the aromatics such as garlic, ginger, onions, star anise and a cinnamon stick. 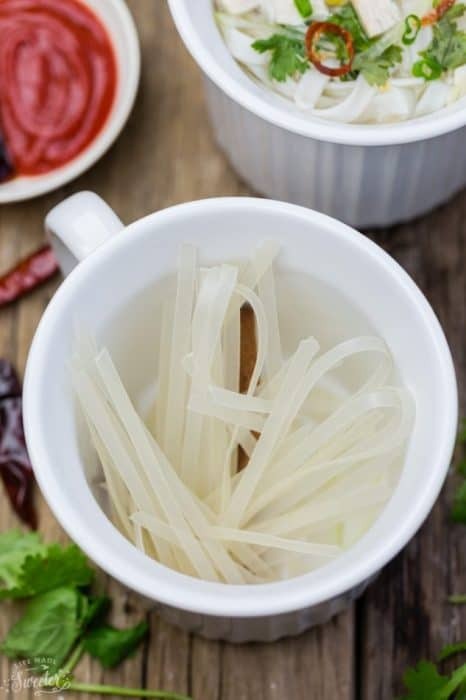 Then break up your rice noodles so that they fit nicely into the mug and add a little bit of fish sauce, which is the key ingredient to adding that umami flavor. Pour in your chicken stock or broth and be sure to push the noodles down so they are completely covered with liquid. Then microwave on high (WITH the lid) for 5 minutes or in the oven (WITHOUT the Lid) for 15 minutes. Let it steam covered with the lid for 10 minutes and then you’re done! The toppings are absolutely what make pho special. 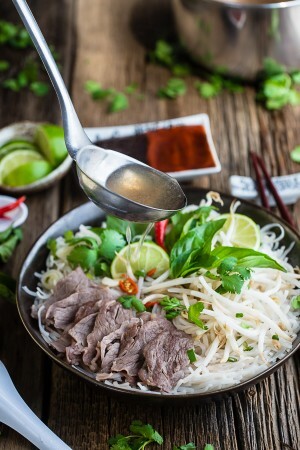 Garnish with your favorite Pho toppings and you’ll be in faux heaven pho sho! Disclosure: This is a sponsored post created in partnership with CorningWare. I have been compensated for my time, however, all opinions are 100% my own. 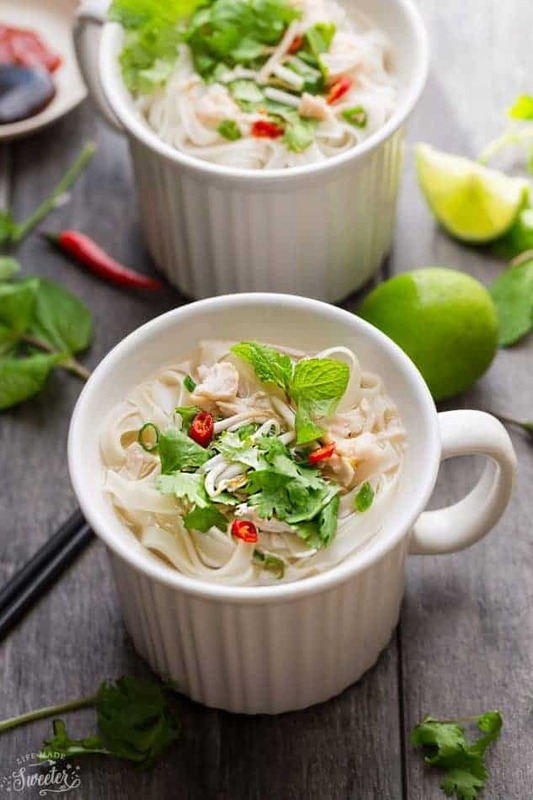 Faux Chicken Pho makes the perfect easy weeknight meal with all the favorite flavors of the classic Vietnamese noodle dish. Place garlic, ginger, a few slices of onions, star anise, cinnamon stick and rice noodles and fish sauce into a Corningware™ Meal Mug™. Add the chicken broth, making sure all the noodles are submerged under the broth (push down with a fork and break any noodles if necessary) and cover with the lid with the steam vent open. Microwave on high for 4-5 minutes (Mine took 5) until noodles have softened and are almost opaque. Allow to steam for 8-10 minutes until the noodles have softened and expanded. Carefully remove lid and stir with fork and remove star anise and cinnamon stick. Add shredded chicken and garnish with remaining sliced onions and toppings of your choice. Serve immediately with a splash of lime and sauce(s) of your choice. Preheat oven to 400 F. Add the chicken stock/broth making sure all the noodles are submerged under liquid (push down with a fork and break any noodles if necessary) and carefully place the mug (uncovered) in the preheated oven. Cook for 15 minutes or until noodles have softened and are almost opaque. Using oven mitts, carefully remove the meal mug from the oven (it will be very hot straight from the oven). Give the noodles a stir with a fork and cover with the lid with the steam vent open and allow to steam for 8-10 minutes until the noodles have softened and expanded. Carefully remove lid and stir again with fork. Remove star anise and cinnamon stick. Add shredded chicken and garnish with remaining sliced onions and toppings of your choice. Serve with a splash of lime and sauce(s) of your choice.